Epic solo roadtrip. Also, Tina Fey is hilarious and intelligent and I’ve been hearing great reviews of this book since the day it came out! 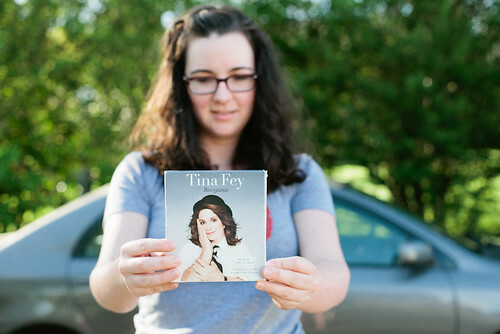 Tina Fey was in my car! I was distrustful of audiobooks, but a friend whose judgment I value greatly recommended I try again, with this book specifically. The author reads it! She’s hilarious! They changed every “book” reference to “audiobook”! Were there a million muttered disclaimers in the paper version? Because those were pretty awesome, and Tina Fey read them so much better than I would have. Oh, right, the content of the book itself? I loved it. I knew I would. Awkward bossy nerdy theatre girls? I KNOW ALL ABOUT THOSE TYPES! Also, I loved the mix of biography, education, and story-telling. It wasn’t until the second listen (on my drive back to Virginia) that I realized the book was laid out chronologically. The stories flowed so nicely, and I enjoyed the transitions, and I sound like a doting mother the way I’m talking about this, so it’s time for me to stop. NO! WAIT! ONE MORE THING! She totally affirmed my strong belief that lists of three are always best.